For months Ronald and I have been exclaiming "You're doing it Peter!" (a line from the movie Hook where Peter Pan starts to fly). We say it in moments where I talk about how I made dinner three nights in a row, or when Ronald finishes a book. We also say it when I did something creative, or went a few days without having a strong suicidal thought. Robin Williams played Peter Pan in Hook. How strange to think about the line Ronald and I share in the light of Robin Williams' death. He played so many iconic characters I grew up with. I've watched his movies dozens of time and his death is a devastating loss to us all. I know a lot of people have the misconception that suicide is a choice. That it is giving up. But the truth is suicide is the result of an illness. 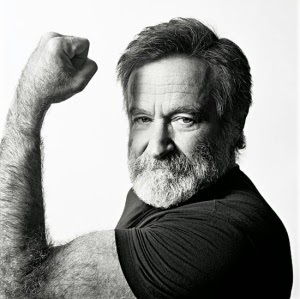 I respect and admire Robin Williams for fighting his battle with depression. For smiling and working and raising children. For being compassionate and getting out of bed. In the end depression took his life, not him. The thing it has highlighted for me most is how little people understand about mental illness. I so want the stigma toward mental illness to end. But the first step is to work through the huge level of misunderstanding surrounding mental illness. I am going to start writing more about my struggle with depression here. I hold back a lot because I'm afraid my readers will think I am bitching or just another sob story. But that seriously doesn't matter. My passion to help others in the same situation is way stronger than my fear. So stay tuned for more honest posts about my day to day life with depression. Ronald and I are still going to say "You're doing it Peter! ", and each time I'm going to have a tender though for Robin. He will be missed. 1) Great post. Great. And I am happy/sad about "you're doing it, Peter!" I love that movie and I love that line and I am so sad for Robin's battle and for his family and friends.